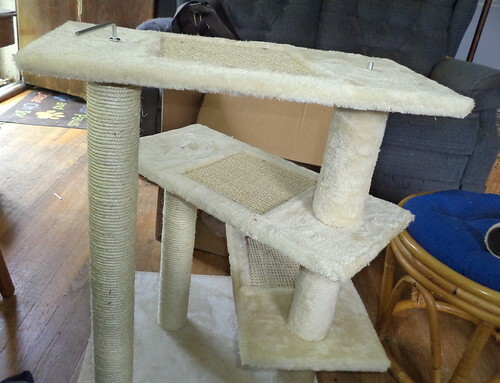 I think it was four years ago now, Carole and Larry gave me a cat tree they had which wasn't useful. The girls were, at first, intimidated by it, but Pilchard, in particular, grew fond of it. Then, one day, I was in my office and I heard a horrible crash in the living room. Racing there, I expected to find someone injured. 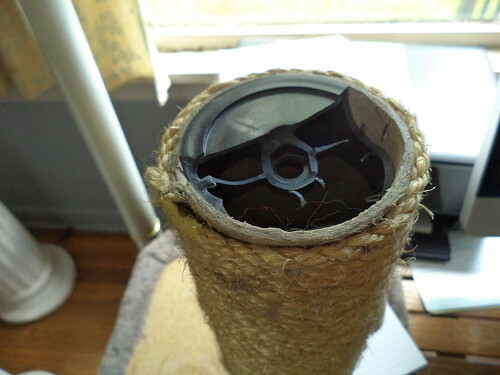 Instead, I found two cowering cats and the top of the tower on the floor. Pilchard had tried to climb up onto that rung and the connection between it and the rung below, snapped. It couldn't take the force of her jumping up onto the platform. 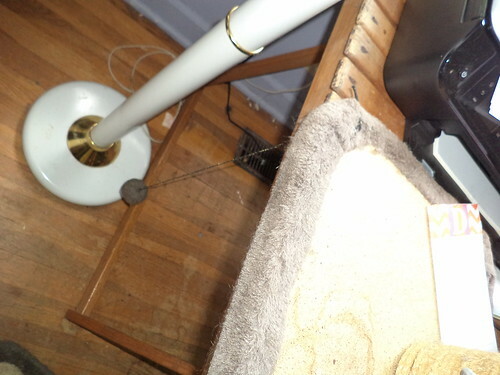 I couldn't see a way to fix it so I kept the top, as it had a dangle ball which was enticing, affixed to it. This has served us well for some time. Ironically, it's just the right height for me to lean on while sitting in my chair. It was close to the height of the table so a cat could walk across the table (in front of me, naturally), and take up a spot on the top of the tree; perfect height for ear scratches. But, this year, it started getting wobbly. 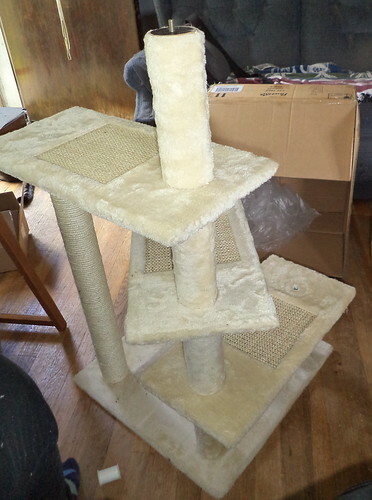 It looks sturdy, but when Pilchard would jump to the top shelf, the thing would wobble. Increasingly, I was worried she'd topple it and get injured. Flipping the thing over, I discovered this. No wonder it was wobbly. I checked all my parts and bits and collected things and I had nothing to make this secure. 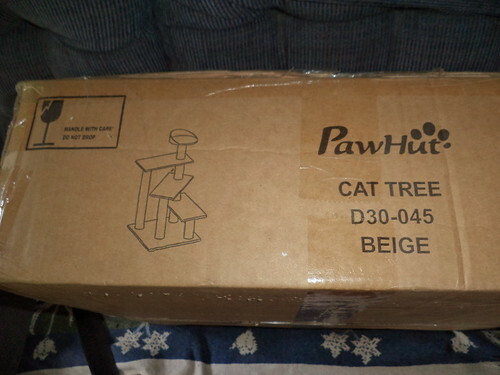 I had been giving some thought to a new cat tree anyway. After a trip to the hardware store and coming home with a nut bolt combination which didn't work, I decided a new tree was in order. For the record, I was out 57 cents for the nut and bolt I bought. I've added them to the collection I maintain in the basement. You never know. I ordered from Jet.com because I had a coupon. They bill themselves as an Amazon wanna-be. They don't have the huge inventory Amazon does, but their prices are reasonably competitive. I looked at my local pet store, as bringing it home same day is very appealing. But they didn't have the size I wanted for the price I could pay. Even with shipping, online was cheaper. So, I got one online. 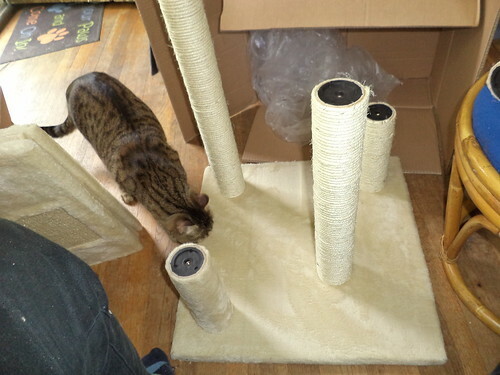 It was a rather big box, since this is 28 inches tall, and there was assembly required. Unlike the birdbath I assembled in May, all the companion pieces were in a bag I could clearly see. Oh joy. Yet another hex key. I should collect all of these just to see how many I have. They must be ridiculously easy to manufacture, since everything I've purchased which needs assembly, has one and doesn't assume you have the right size. I sorted everything out and pulled out the instructions. 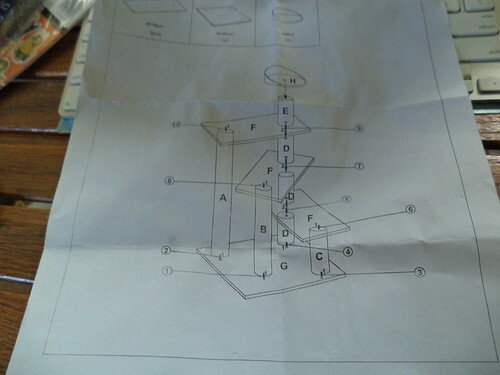 There's no "Step 1: Affix column A to slot A using the bolts marked 1." I had to figure out which column was A, B, C, and which platforms were D, E and F. The short column connectors were reasonably easy to discern from the bolts. 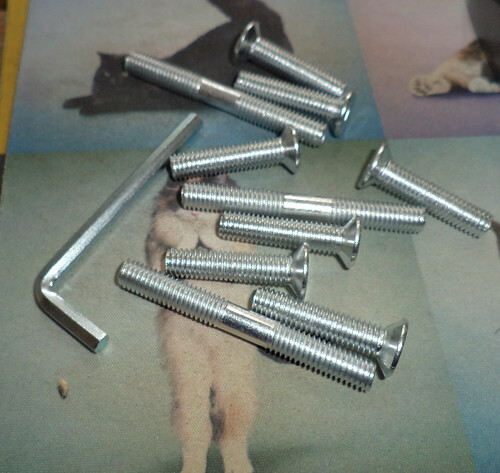 Bolts were all the same size, thankfully. I dived in. The problem was, without a corresponding mark on the bottom platform, I got posts in the wrong place, which I didn't find out until I was ready to assemble the middle platform. 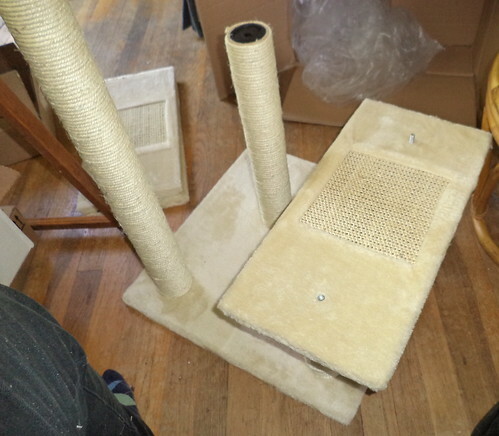 I had to disassemble what I'd completed and put the posts in the right places, which weren't completely clear. 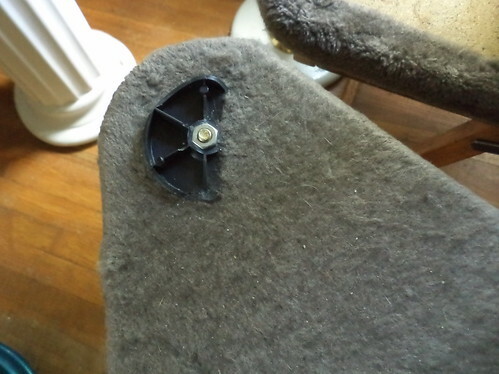 The hex screws did make taking the thing apart easier, I have to grant that. 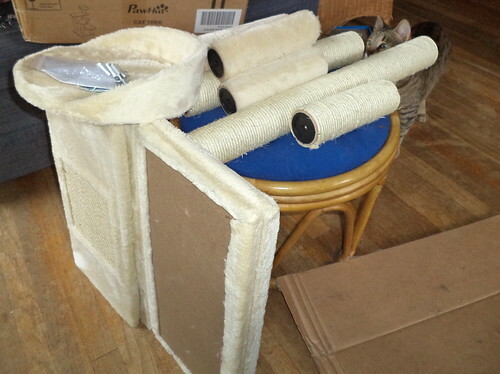 I have much more leverage to make sure they are screwed in tightly, so important to prevent posts from loosening with repeated jumping on by cats. I liked this tree because of the sisal insert. 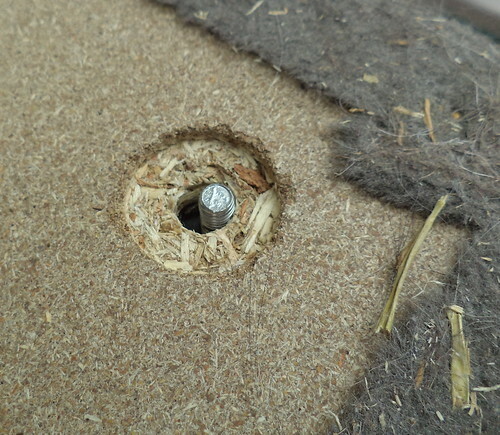 An added benefit is the soft carpet on the levels. 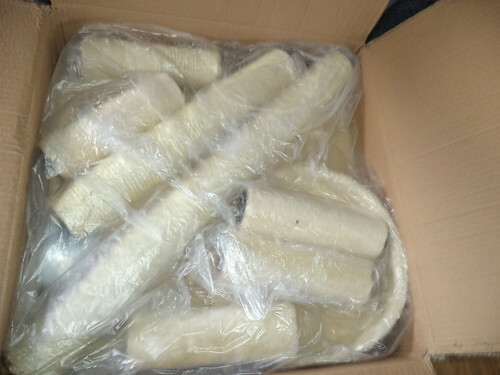 The posts are all covered with sisal. This lone upright post holds a bed which is, realistically, too small for anyone to be comfortable for any length of time. Pilchard has started to use it when she sits next to me if I'm on the computer. The top level is the same height as the old tree, so it sits next to my chair and I rest my elbow on it when I'm gaming. It's the same height as the table so, when I'm paying bills, I use it for sorting. I removed the ball from the old tree and stapled it to the top edge of this one. No one seems to care. 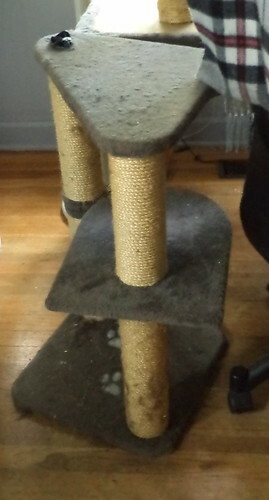 I took the other tree out to the street, thinking someone might be willing to cannibalize it for parts for their cats. If no one took it, I'd just toss it in my garbage. I saw several people slow down to look at it, but they all moved on and I wound up tossing it. Mija and Hamlet don't lie on this at all. Pilchard, on the other hand, is thrilled. 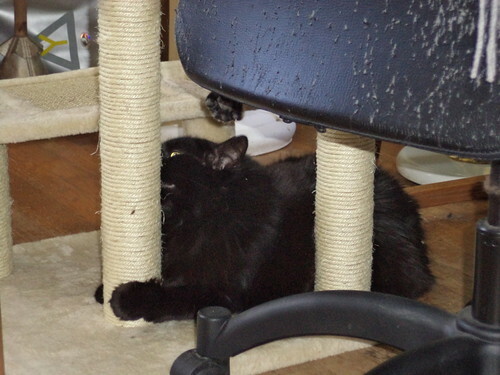 It had been up 24 hours and I came into the living room to see her climbing all over the thing and attacking the posts. She climbs the levels to sit beside me for scratches. I'm a touch disappointed the other two aren't interested, but Pilchard's use makes this a good buy. The stability is wonderful and, for me, the ease of assembly was a great plus. I feel we'll get quite a few years worth of use out of this.